The saying goes “rubbish in equals rubbish out”. This applies to grilling a great steak. If it’s not great to start with then you will have an almost impossible task trying to make it better during the grilling process. The quality of the meat will decide the taste of the steak. What meat is best for grilling and what should the quality be like? There are so many varieties available in your stores, and price does not necessarily mean best for grilling. If you are lucky enough to have a butcher in your area, then I would always suggest getting your steaks there, especially if you like medium or rare. It tends to be fresher and the butcher can give you some great advice. Or even in your supermarket they often have a fresh butcher section. Try there for your steak. Here are some tips on getting through the jargon. The cut of Steak, what does that mean? Without going through all the steak cuts, from experience the best for grilling are rib Eye, T bone, Porterhouse, Strips Steak and Sirloin. They have more fat, which is what you need for grilling. Fat gives flavor and keeps the steak moist. Lower fat steaks, like fillet and tenderloin, dry out and can look shrivelled. My favorite for the barbecue is rib eye. But try them all out. Marbling is the visible lines of fat that you see going through the meat. The fat is what gives your steak its great flavor. Now of course the more fat you have on your beef, the less healthy it will be. But as long as you don’t over do it, I’m sure its fine. The marbling should be thin lines of fat and should be evenly distributed throughout your steak. Just try to avoid thick marbling, as this will produce a tougher steak. The grade is easier. There are three different grades. They are Prime, Choice and Select, in order of quality. You probably won’t get much prime in your supermarket, these are the top end expensive cuts and are more often found in restaurants. So you will be looking at choice or select. So try both and see what you think. I have found great select cuts at good prices for use on my grill. So for starters test out a rib-eye, T-bone, Porterhouse and Strip to see which one you like the best on your grill. Want to remove stuck on food on your pots? Try simmering baking soda and water in the pot. If you cooked something with eggs in there, use flour and milk but soak the pot first in cold water. Like most people, we are a very busy family here, so we often order out which can quickly add up. However, with the economy taking the downturn it has, everyone is looking for ways to save money. I recently read in my local newspaper that people are joining food co-ops and buy whole cows to save money. Another great way to save money, is to quit ordering out. Instead, you can save a lot of money by making homecooked meals. This easy to make recipe is not only easy but pretty cheap to make also. This recipe will make 4 servings, and the total cost of this meal is $13.04 (which include the serving suggestions). Where else can you feed your family for that cheap? I do have to thank Prego for this great recipe to try out. My family loved it and I am sure yours will too! Heat oil in a 10 inch skillet over medium high heat. Add the chicken and cook for 10 minutes or until well browned stirring often. Stir the sauce in the skillet and heat to a boil. Reduce heat to low. Cover and cook for 5 minutes or until the chicken is cooked through. 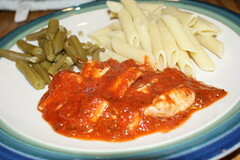 Serve chicken mixture with the pasta. Serving suggestions: Served with whole green beans and soft wheat dinner rolls. Dessert should be mini-eclaires.